Buffalograss (Buchloe dactyloides)is a warm-season perennial grass indigenous to North America's western prairies. Grown for its low-maintenance drought-resistant qualities, the grass is found in parks, golf courses and residential landscapes. Buffalo grass doesn't invade flower beds or vegetable gardens and is suited for clay soils and dry climates. Buffalo grass features flexible, curling blades that contribute to its dense, turf-like appearance, a quality not found in other native grasses. 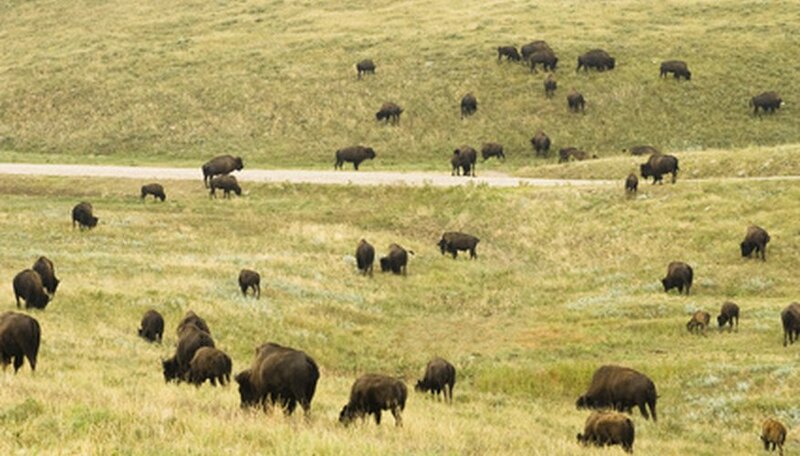 Buffalo grass is found as far north as Montana and as far south as central Texas. Due to its large geographic range the best time to plant buffalo grass is best determined by the growers' location. Horticulturists from the University of Missouri recommend planting grass in May and June, while Texas growers suggest an April through May planting season that can be extended to July and August with adequate irrigation. Growers overwhelmingly recommend late spring and early summer planting. Nebraska agricultural scientists note that buffalo grass grows quickly during June, July and August. Late-summer plantings are not recommended, because young root systems are not likely to harden in time for oncoming cool weather. Homeowners plant buffalo grass from treated or untreated seed. Treated seeds undergo a cold treatment process, or a chemical bath to help break seed dormancy. Treated seeds have higher germination rates than untreated seeds, but both are sown via broadcast or drilling methods. Sow treated seeds in early spring for germination within a week to 10 days. Plant untreated seeds in early fall for spring germination. Depending on seeding rates, a buffalo grass lawn may take several seasons to develop. Sod and plug plantings establish faster than seed plantings and also have other advantages, such as a more aesthetic appearance. Seed plantings, unlike sod, yield both male and female grasses. Male grass produces long spikes that detract from the lawn's appearance. Sod is vegetatively propagated and produces female grass, which has a smoother appearance than male grass. Landscapers place 2 square inch sod pieces or plugs within 6 inches to 2 feet of one another. The higher the plug density the quicker a lawn is established. Root systems dry out rapidly, causing plugs and sod pieces to die, so plant in early spring or fall -- even summer -- so long as moisture levels are high. Over one dozen commercially available buffalo grass varieties exist, some better suited for vegetative propagation and others designed for seed propagation. Bison, Cody, Tatanka and Plains varieties are recommended by Missouri horticulturists for seeding. 609, Stampede, and Bonniebrae are vegetatively propagated. Consult with your local nursery, garden center and university extension to find the best variety for your soil type and climate.